Joe Wells, of whom it has been said. 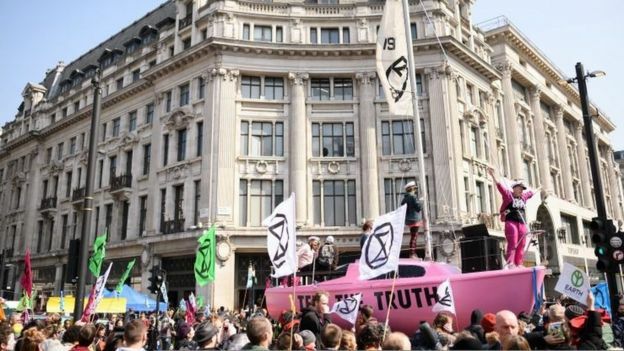 : The Extinction Rebellion Climate protest. I was going to post on the Extinction Rebellion Climate protest yesterday but I ran out of time as I had to post on the Game of Thrones, but that as they say quite literally is another story. Time has moved on and for the second day London and I believe other cities around the world have been targeted by thousands of people who blocked the streets and stopped the traffic as a protest about pollution. I’m assuming that no-one had pointed out to them that by stopping the traffic they were adding to the pollution but one feels these people probably don’t care. On top of adding to the pollution by stopping traffic they also threw what I believe was oil over the Shell building, yet more pollution. Protester Olivia Evershed, 23 said; “I hope that it’s really going to bring awareness about the emergency crisis that we are in, and encourage the government to act. Somewhat of an over statement of the situation I must say as the percentage of world pollution from the UK is 1.21% and as most of the world pollution comes from places like China the USA and India I would suggest you are protesting in the wrong place. I believe the population of India is expected to double in the next 10 years and if I’m not much mistaken China will also increase dramatically, now if their figure of 12 years is correct we are all dead anyway, so I suggest they stop being so melodramatic. 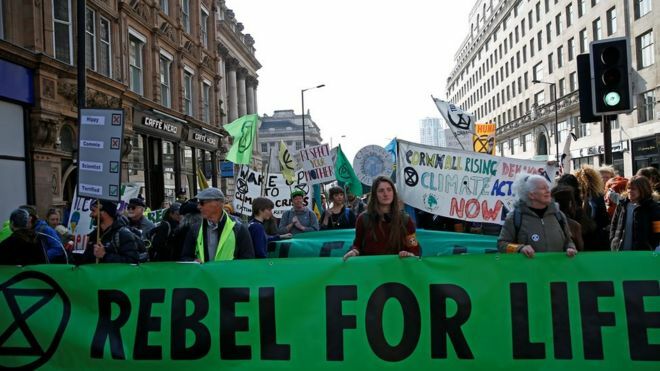 I’m forced to wonder how all these protesters travelled into London, did they all walk, for surely that is the only way they must have arrived as if they used any form of transport, bus, train, car, taxi they too would be adding to the pollution in London. I somehow doubt they all walked. People seem to forget that any form of transport causes pollution even a bicycle for you cannot make a bicycle without using some form of energy to source the parts to deliver them to the factory that manufactures them, then the energy (welding etc) used to construct the bicycle. The bicycle then has to be delivered to a shop or warehouse prior to delivery to the purchaser, yet more pollution. Even using public transport causes pollution and I’m forced to wonder how the lorry they used to block the road entered London, was it running on fresh air and what vehicle was used to tow the yacht they used to block the traffic? Even electric vehicles cause pollution in their manufacture, according to a report by Friends of the Earth, the extraction of lithium which is used in the batteries harms the soil and causes air contamination. Now we have Chris Packham joining in with his support for the campaign. I have to admit it leaves me lost for words, this from the naturalist who travels the world making wildlife films no doubt in the company of a film crew and all the equipment necessary for filming is joining a protest about pollution, what about his carbon footprint. My suggestion for all these protesters is to walk home and stop polluting our cities for before you start criticising everybody else look to your own actions, and remember as the old saying goes; if you live in a glass house, don’t throw stones.